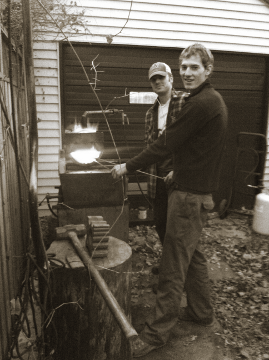 « Ahh, finally – blacksmithing! A couple of my friends from school have been helping me re-shingle the roof on my house. One of them had been asking me about my gas forge. And so, after cleaning up tools and such after a day of roofing, we decided to fire it up so they could try their hand at some smithing. Good times! We’ll definitely have to do more of this type of thing. This entry was posted on Sunday, November 18th, 2012 at 7:02 pm	and is filed under Student Life, The Journey, Tidbits. You can follow any responses to this entry through the RSS 2.0 feed. You can leave a response, or trackback from your own site.